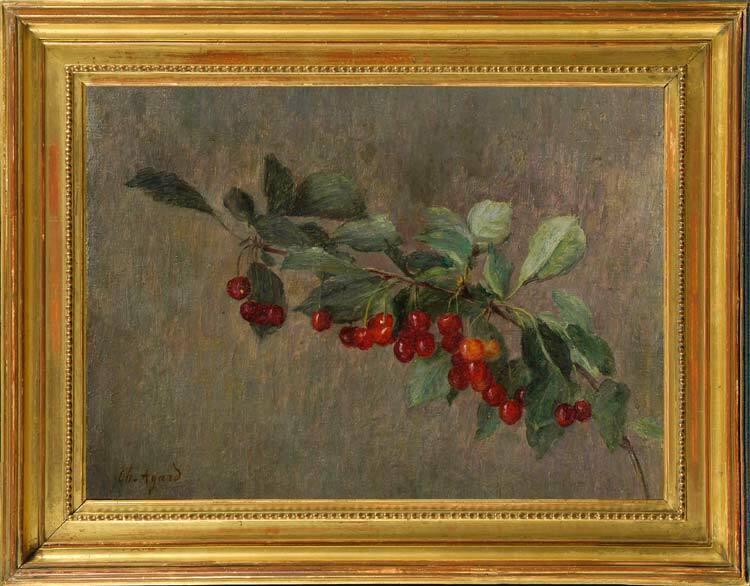 A beautifully-executed study of a thickly fruiting branch of cherries, this small painting is at once highly finished, extremely realistic, and very decorative. The subject, the composition (a branch set diagonally across the page, with large areas of space around it) and the undefined background all suggest that Agard must have been looking at 17th century Japanese screen paintings. Japanese art and artefacts had been imported into Paris from the 1850s; in 1862 a shop selling contemporary oriental goods opened in the rue de Rivoli, and by the 1870s Japanese antiques were being collected. The 1878 Exposition Universelle was particularly important in exposing Japanese objets d’art to Parisian eyes, and it is likely that Agard visited the exhibition with his parents. But he has not painted a japonizing spray of blossom; he has painted the fruit, a product of Limousin where he spent much of his life, and he has painted it in realistic European style, thus completely integrating the eastern influence in his work as Degas and Monet had done. Charles-Jean Agard was born in the Dordogne in 1866, and studied at the Ecole des Beaux-Arts in Paris and in the studio of Léon Bonnat. He was also taught by Puvis de Chavannes, Eugène Carrière and Alfred-Philippe Roll. (Bonnat’s students included Caillebotte, Braque, and Toulouse-Lautrec). Agard first exhibited in the Salon des Indépendants in 1893, later becoming a member of the Salon’s committee, and also sent paintings to the Salon d’Automne. From 1914 to 1942 he showed his work in the Société Nationale des Beaux-Arts, which had been re-established in 1890 by, amongst others, his teacher, Puvis de Chavannes. He was drawn to post-impressionism, executing landscapes in a luminous and brilliant register, mainly in Limousin and the Ile de France, near his house in Nesles-la-Vallée. He also produced portraits, flowerpieces, drawings and still life paintings. Works in public collections include a large group of paintings and drawings in the Musée Louis Seniecq, L’Isle Adam, near Paris.